You can learn a lot about a child when you do self-esteem worksheet activities for kids. Something about a child writing down on paper things about themselves opens up the conversation. It is an opportunity to discuss what things bother them and what could be bringing down their self-esteem. Check out these fun self-esteem worksheet activities for kids! What sort of self-esteem worksheet activities have you done before with your kids? Share with us in the comment section below! This is super easy to create, just number a paper 1-5 with the title ‘5 Things I Like About Me’. You can do this a few times. The first things that might come out when it comes to kids are things like ‘My hair’, ‘My nail polish’, which is to be expected with younger kids. You should try this too; it is not as easy as it sounds! There is no wrong answer; the idea is to help boost kid’s self-esteem right? Includes pieces that say ‘I think I am’, ‘My family’, ‘My favorite thing’, ‘When I grow up I want to be’ and ‘Sometimes I need help with’. This is simple to create, just a regular white piece of paper and make lines that resemble puzzle pieces and write the topics inside (small, so there is space to write). You might be surprised what you learn! On paper, make nine squares. The center one will be ‘My Name’. In the others, write things like ‘A compliment that someone gave me’, ‘Nice things my friends and family would say about me’, ‘For fun I like to’, ‘2 words to describe myself are’, ‘2 things I am good at’, ‘Something nice I have done for someone else’, ‘One thing most don’t know about me’, and ‘One thing that makes me laugh’. Give them some time to think about it, you should do it with them! You can’t always talk about the good without talking about what they struggle with right? On paper, divide it in half and on one side is ‘Strengths’ and the other is ‘Challenges’. This opens up the conversation to discuss what they struggle with and the opportunity to work on it! I like this activity with any age because you get to see on paper how they see themselves! All you need to do is draw out the lower half of a face (basically a giant ‘U’). You can add a neck and shoulders (it’s not that hard!) Have crayons and other mediums available and sit back and see how they see themselves! It opens the conversation up as well to discuss that it is what is on the inside that is important, and also how different we all are! When you have worksheets to work with, it makes it easier to discuss what self-esteem is and how our actions and words can affect someone else’s feelings. My favorite is the self-portrait, it is pretty enlightening! 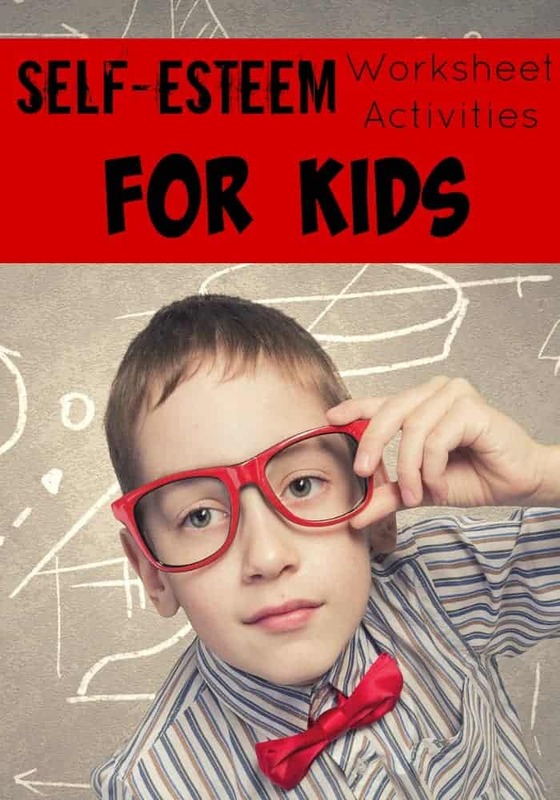 What a wonderful activity ideas for kids! I believe my 4 year old did something very similar in school and we helped him put the things he loves in a little bag with his picture on it. I thought that was so much fun and he gets to take them out one by one and tell the class about it. I love the idea of having kids draw their self-portraits! I’d love to do this with my nieces and nephews–great activities! Awww… I really like this! It’s so important to teach kids to have good self esteem! We shouldn’t encourage them to be proud but self esteem is good! These are some great ideas. I would love to try these with my kids to see what they write. It would also open up some great conversations. These are so fun! I would love to do these with my daughter just to see what she writes! I love this! I am going to share with my kids preschool teacher. Their main focus is building kids self esteem before entering Kindergarten. Thanks for sharing with us! I love this! I am definitely going to be incorporating this into the first couple of weeks of our next homeschool trimester. Thanks for sharing. Self-esteem is so important, especially for kids as they are growing up. As someone that suffers with poor self-esteem I think these activities are so important. Children go through a lot more than we give her credit for and these activities will boost their morale and self-confidence. I like this kind of activity for children. Get to know them better while involving them into the activity. By letting them describe about them selves, it helps us as well to see them through their eyes. This would be a great thing to do with the kids I nanny. So, important to build each other up! These are great worksheets for developing self esteem. I love this idea, very often kids who underachieve at school are those that believe that they can’t do it. 9 Budget-Friendly Activities Your 15-Month-Old Tot Will Go Nuts Over! Demand Feeding vs. Scheduled Feedings: Which is Better for Your Baby?